Have You Been Hurt in a Florida Parking Lot Car Accident? People get hurt in parking lot car accidents all of the time in South Florida. Some of the reasons for these accidents occurring relate to our active tourism industry and our large sports venues and shopping malls. However, parking lot injuries aren’t just happening at these large and popular locations. They also happen at our smaller local hotels, restaurants, bars, condos, apartment complexes, grocery stores, gas stations, schools, parks, beaches — just about anywhere that people go and park their cars, trucks, motorcycles, and SUVs. Can A Low Speed Parking Lot Car Accident Mean Big Injuries? While most parking lot accidents are not high-speed crashes, this does not mean serious injuries do not occur. For example, someone walking to their vehicle can be struck by a slow moving vehicle and be severely injured from being pinned between two cars (In Florida, this is known as a pedestrian accident, and the Florida Legislature has passed a specific set of laws dealing with these car accidents). Likewise, a low speed fender-bender involving two cars in a parking lot, like a rear-end accident, may appear harmless, but sometimes these small crashes result in big injuries. The neck, spine, and head of the human body are all vulnerable to snapping types of force, and a minor speed can still cause whiplash and other severe injury to someone’s spinal cord or nervous system. What Should You Do If You Were Injured in The Parking Lot Accident? If you were injured in a parking lot accident, you should seriously consider taking an ambulance to the hospital because injuries are often undetectable until days, even weeks, later. Read: Do You Still Have An Injury Claim If You Wait To See A Doctor Or If You Don’t File A Timely Incident Report After A Car Accident Or Other Personal Injury? Furthermore, pictures of the scene should be taken immediately, along with taking account of any witnesses, their phone number, and address. This information will come in handy if your claim becomes a personal injury lawsuit, as witnesses and photos are a few of the best ways to prove what happened at the time of the crash. any additional expenses such as casts, wraps, bandages, etc. Read: How Do I Pay My Medical Bills After a Florida Car Crash? Can You Sue The Owner And Operator Of The Parking Lot For Your Car Accident? In Florida, the owner or operator of the parking lot can also be held liable for car accident injuries under our “premises liability” law. According to this law, the owner or operator of a parking lot is required to keep the parking lot reasonably safe for those who use it. For example, an owner and/or operator must protect those who use the parking lot from known conditions, and conditions that the owner or operator of the property should have known about, like missing stop signs or direction signs. If the owner or operator fails to correct a dangerous condition such as a missing stop sign, then they may be required to compensate a victim for any injuries that can be attributed to the owner’s negligence. The good news for a victim is that both economic and non-economic damages can be awarded in these cases. Economic damages includes things like medical expenses and lost wages, while non-economic damages are things like disfigurement and pain and suffering. Read: Why Does It Matter If Someone Wasn’t Acting Reasonably At The Time Of An Accident? 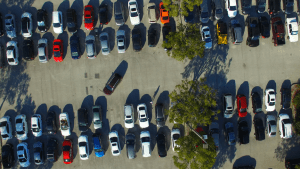 Police And Parking Lot Accidents – Can Tickets And Reports Help A Victim? If you’ve been in a parking lot car accident, then you should contact the police immediately. Police involvement is a good idea because a police officer can prepare a written report of the details of the crash. Also, at trial, a police officer can testify about what he or she witnessed around the time of the car crash, which can prove to be very credible evidence. However, just because a victim contacts the police doesn’t mean a police officer can issue a ticket, even if the victim is injured. That’s because there are both private and public parking lots. For example, the Miami Parking Authority operates parking lots as part of the public infrastructure. The laws that apply to someone parking in a public parking lot to attend a Marlins game can be different than someone who parks on a private lot (there are limits on the amount of money a victim can recover for suing the government for a personal injury). If the lot is a private parking lot, then law enforcement may not be able to ticket the negligent party. This does not mean that the police officer will not be helpful, just that he or she will not make an initial assessment of any Florida law being violated. A good piece of advice if you have been harmed in a parking lot car accident, is to speak with an experienced personal injury lawyer before you file a claim to learn about some of the issues that can arise with these claims, including the type of evidence needed to prove a claim and the type and amount of damages you can recover. Most personal injury lawyers, like Alan Sackrin, will offer a free initial consultation (over the phone or in person) to answer your questions.